More sports than you can shake a Dilfer at! "Hey Ladies! 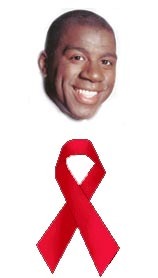 Just because I have the AIDS doesn't mean I'm gay. No, really ..."
Many years ago, as the greatest college player of all time, I thought I would come into the NBA and dominate my new home in scoring. It was so sweet to throw up a mid-range jumper, a pretty three pointer, or a finger-roll to win the game. I even got the chance to live out my dream and beat the Boston Celtics with just ... one ... shot! But I realized even then my place in history would never be complete unless I could be a more well-rounded player. By changing my focus from points to assists, I became the career leader for the NBA and set many other assist records as well! Truly my dreams were coming true as a boy from Michigan could never have dared to imagine. But even then I knew that some people might not know I was the greatest. So I slept with lots and lots of WOMEN! I stress women because some hater types might stereotype me because of the AIDS some woman, who isn't in the Basketball Hall of Fame I might add, gave me. That's why I had to change focus one more time to ensure my greatness for all times' sake. I've gone from making points to assists, and now I'm going to go from making assists to antibodies. While I averaged over 20 points per game, I endeavoured to get my assists above 11 per game. Now, I've reinvented myself again, as the greatest antibody producer of all-time, to get my white blood cell count above 4000 per microliter. I might do even more than that if my body calls on me in playoff time, where white blood cell count producing legends are made. No one, not Larry Bird not an incurable virus we barely understand, no one can stop me from achieving my goal of greatness. 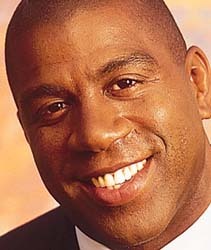 You can bank on that, because I'm Magic Johnson: The Greatest Player in NBA History.